I will never forget my first Max Effort bench press team training at Elite Performance Center, EPC for short. It was a cold, cloudy evening; the sun was dipping as night rolled across the sky. A slight chill nipped at my face as I stepped out of my car – my foot landed in a small puddle. I had no idea what to expect. While walking towards this little door I could hear a booming sound system, the crash of what sounded like thunder clapping and grunts. I knew before I set foot into the door that this would be my new home. As I stepped into the gym and my eyes adjusted to the lighting, I was quickly hailed down to the bench press station were the team eagerly introduced themselves and plopped me straight on the bench to get warmed up. Long story short, I was put through the toughest bench workout/assistance workout I had ever had. I was able to push through it thanks to the support and encouragement from my peers. It was that night I was introduced to this very unique, one of a kind gym- sporting a variety of special tools to the trade. The equipment found at EPC is not only very unique but most of it is literally one of a kind, evolved and created by owner, coach, and power lifting monster Chris Duffin. Let’s start off with the machines, or lack thereof. Each machine in EPC is there for a reason- you won’t find any of them at your local commercial gym. The machine I call the “Jammer” is a standing duel arm shoulder press which allows for a vast amount of exercises with room to add bands and numerous plates. Other “machines” include a gem pull up (narrow, wide you name it) and dip machine with a belt you can wear to ADD weight, instead of those at a commercial gym that provide assistance; EPC also sports a one of kind leg press. The true heart and soul of the gym equipment lies with the Kabuki Strength benches/mono super lifts created by Chris. These benches and mono lifts provide an optimum positioning for the lifter and spotter and allow for an array of exercises ranging from speed band benching (more on this soon) chains, floor presses, reverse bands and much more. Each station is equipped with its own specialty bar, from 55lb Texas Power bars for when Chris or Shawn put on over 1,000lbs to squat, extra snappy/long dead lifting bars and other specialty bars such as, Safety bar, axel bar (fat grip) football bar, trap cage, buffalo bar and many more. Most of these are very rare and allow for a dynamic workout. 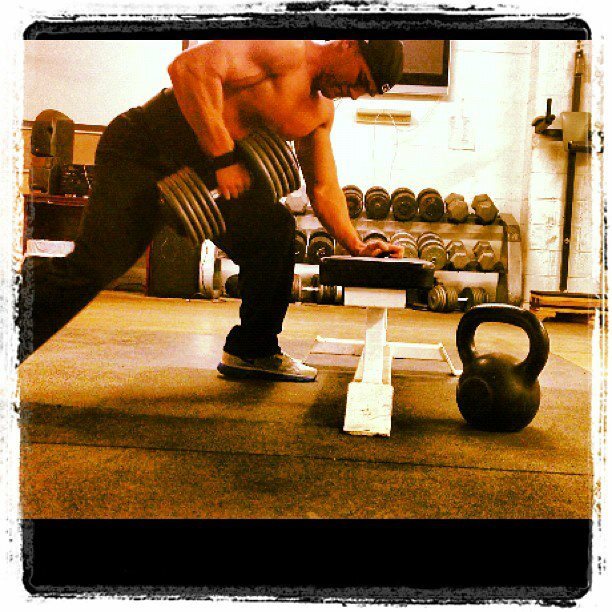 This gym also boasts of its 200lb dumbbells which are repped by team member Adrian Larsen. Seeing how this gym draws a variety of athletes, EPC has a variety of bands, from Mini’s to thick black/purple bands with tensions measuring nearly 200lbs. EPC also has a full kettlebell set up, small tires and massive ones from GPP and Strongman; likewise EPC has yokes, farmer walk, atlas stones, rings, sledge hammers and kegs, Olympic lifting platforms and much more. What doesn’t EPC have? People reading a magazine while sitting on the stationary bike… and a juice bar. Members at EPC gather and train here for a great many reasons- we have a very diverse gym and its members range from record holding Power Lifters, Strongman, High Land Games, Oly and pro bicyclists. Each member who joins fully to the gym is given a key which allows 24/7 access. Literally. There is also a stereo system in the center of the gym with an auxiliary cord so your favorite Rock/Metal/Rap is readily assessable. A hard rock strength mix is usually on during team training, speaking of which is one of the special aspects of EPC. We have set training programs personalized to our unique goals and times that we gather to lift, support and push each other beyond our limits. Each session tends to be lead by a coach or two. Elite Performance is owned by Chris Duffin and Rudy Kadlub, power record power lifters and coaches. In my opinion these two are the definition of men and others should strive to emulate their professionalism, lifting skills and passion to helping others succeed in all areas of their life. These two men have helped coach countless record holding athletes and as well as other coaches in the gym. They seek to train and promote your self drive so that you don’t solely rely on them being there for every set. Each of the coaches possess a skill set with the iron and with the human body I have found unmatched by anyone else I have ever met. They are constantly learning new techniques for stretching/lifting and sharing with the other gym members. Some of the other aspects about EPC which make it an epic place to train is that is it sponsored my favorite supplement company in the game. A large USPlabs banner is proudly displayed under a spot light in the middle of the gym. A few scoops of Jack3d/Jack3d Micro pre-workout, tunes cranked, and you will begin to hear members scream with victory as they crush a new PR, and others yelling to encourage them. There is no “volume limit” to our voices, music and for that matter a dress code. On any given night you will find Chris “shirtless” Duffin or me ripping our shirts off and wiping our sweat drenched faces and preparing for the next set as chalk settles in the air and a member rips 700+ dead lift off the floor.